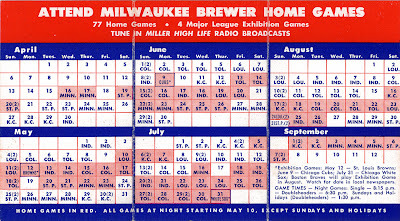 This tri-fold pocket schedule laid out the season for the 1952 Milwaukee Brewers. On the cover we have Owgust chasing down a ground ball, backed by the club's twin pennants from '51; the American Association crown and the Little World Series. 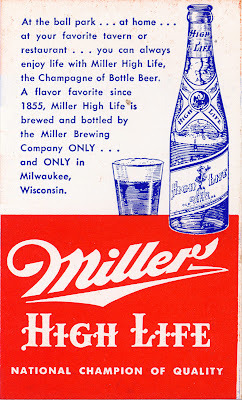 On the interior flap, an ad for the Champagne of Bottle Beer. 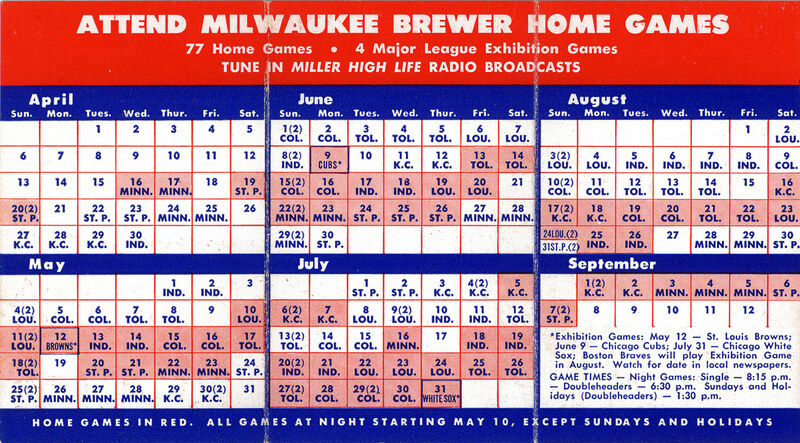 The interior lays out the entire 1952 schedule. A double header every Sunday! 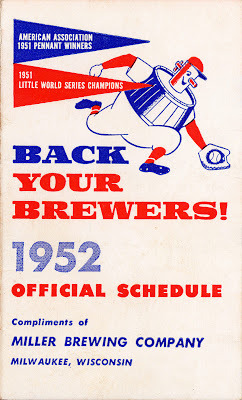 In addition to a full compliment of American Association contests, the Brewers played four exhibition games against major league competition; May 12 against the St. Louis Browns, June 9 against the Chicago Cubs, July 31 against the Chicago White Sox and a TBA date against the Boston Braves. 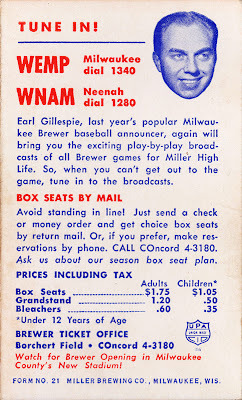 Such exhibition games were commonplace but took on an additional meaning in Milwaukee in the early 1950s. 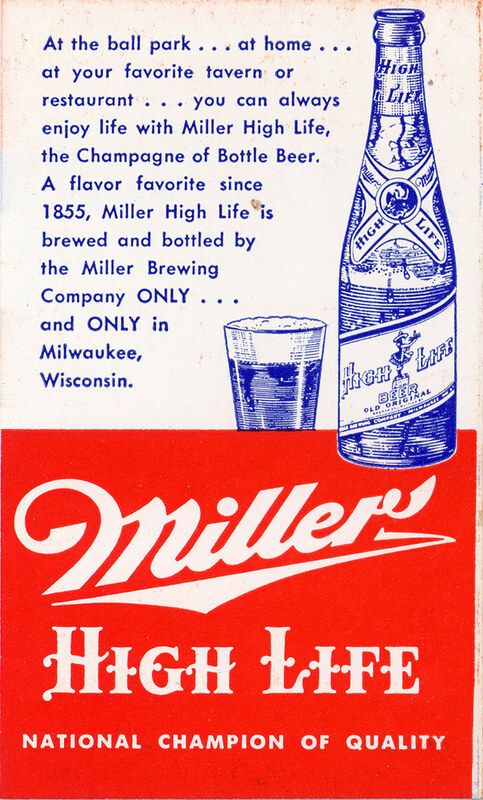 The city was looking for a major league representative, and at least two of those clubs were looking towards Milwaukee. 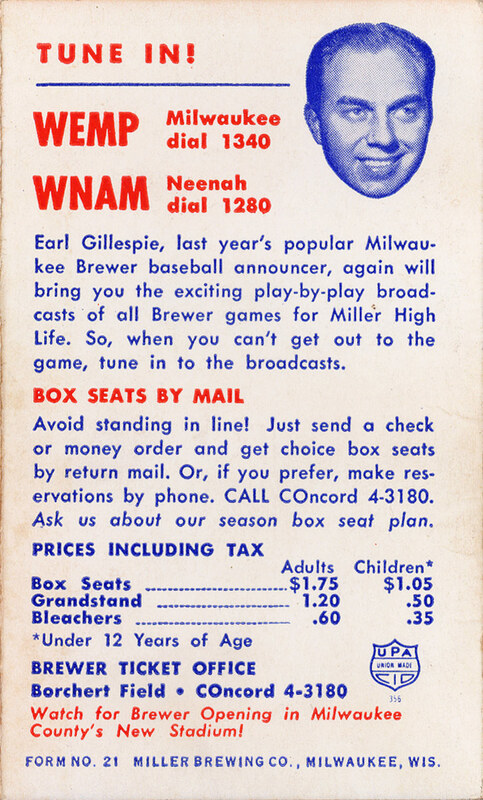 The back cover features Earl Gillespie, the Brewers' sophomore radio announcer. Watch for Brewer Opening in Milwaukee County's New Stadium! 1952 was the final year of pro baseball in Borchert Field. Beginning with the 1953 season, the Brewers would move into their new home at the former Story Quarry. As we all know, it was not to be. County Stadium was built to draw a big league club to Milwaukee. It was a smashing success, drawing the Braves from Boston and closing the final chapter of the original Brewers' history in Milwaukee. But all of that was in the future. There was baseball to be played at the Orchard in 1952, and the Brewers played it well. They finished the season 101-53, twelve games clear for the American Association pennant, ending their era in Milwaukee in style with back-to-back titles.